This article is about how to use VeryPDF Image to Flipbook Converter to convert image to flipbook in your computer. A flipbook is a book with a series of pictures that vary gradually from one page to the next, so that when the pages are turned rapidly, the pictures appear to animate by simulating motion or some other change. Flipbooks are often illustrated books for children, but may also be geared towards adults and employ a series of photographs rather than drawings. Flipbooks are not always separate books, but may appear as an added feature in ordinary books or magazines, often in the page corners. Software packages and websites are also available in flipbooks. What is VeryPDF Image to Flipbook Converter? VeryPDF Image to Flipbook Converter helps you generate flipbooks which could be viewed on Windows PC, apple products, e.g., Mac, iPad, iPhone and other portable devices, for this application supports exporting flipbook of .html, .exe, .zip and .app. Of course, it is powerful in supporting multiple input file formats besides image format, e.g., PDF, web pages and Word, etc.. And it is convenient to publish this flipbook online after you produce flipbook from image file, too. How to convert image file to flipbook file? To install this application in your computer, please download its installer into your computer, then double click it and follow setup wizard to install this utility in your computer. And then, this converter could be used to produce flipbook later. Please firstly run this software, then click Input > click Input Pictures radio> select image files in pop panel Input Pictures > click save, finally image files could be added successfully. Then, you can edit image quality by changing value in edit box Image quality and select image DPI in edit box Resolution. 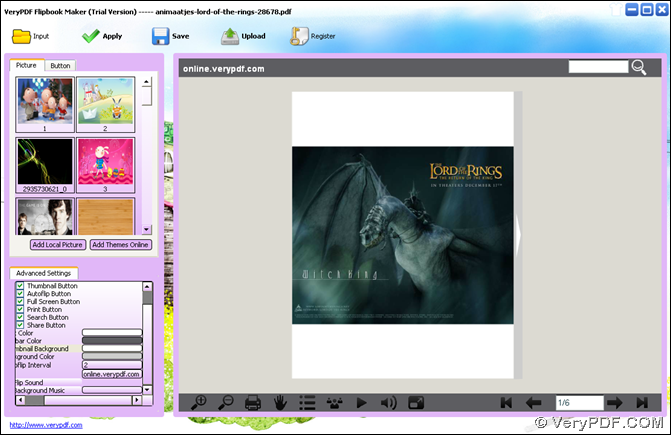 In the end, on this panel, please click Import so that imported image files could be processed into flipbook file after a few seconds, which is located in shown panel of GUI interface. Then, to save this produced flipbook, please click Save > select one targeting format in pop panel, e.g., .html, .exe, .app, .zip, and type targeting path of destination folder in edit box Output Folder, finally, please click Save on this panel so that this flipbook could be saved in your computer. At last, you can conveniently overview your produced flipbook from image files in your own computer conveniently. In case you follow steps above to convert image file to flipbook file with VeryPDF Image to Flipbook Converter by yourself, it will be very easy and convenient to produce flipbook one by one. To purchase this software, please go to purchase page of VeryPDF Image to Flipbook Converter.